LAS VEGAS – During the Consumer Electronics Show 2018, Samsung and Harman together unveiled a new, advanced automotive platform, “digital cockpit,” the first fruits of their joint development of automotive electronics technology since the Korean tech giant bought Harman in March last year. The digital cockpit -- an integration of Samsung’s information technologies and Harman’s in-vehicle infotainment technologies -- aims to connect mobile devices, home appliances and automobiles through internet of things technologies, Samsung said. They demonstrated the system by integrating it into a Maserati luxury vehicle during a press briefing Wednesday at Hard Rock Hotel in Las Vegas on the sidelines of the CES. 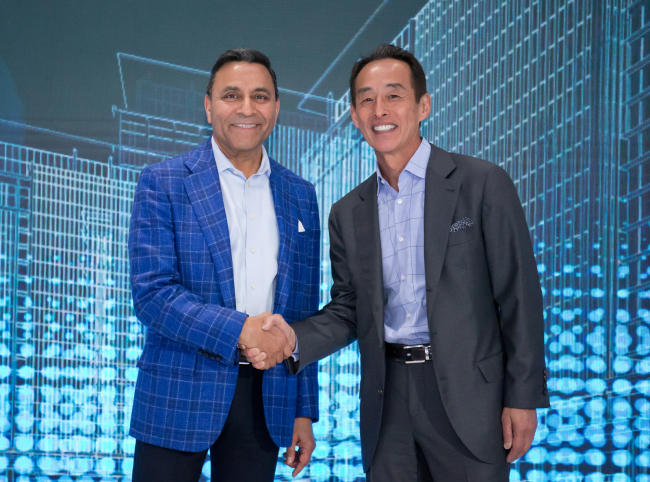 “The digital cockpit technology that can be seen from (the) Maserati clearly shows how Samsung and Harman have created synergies,” said Harman CEO Dinesh Paliwal at the briefing. 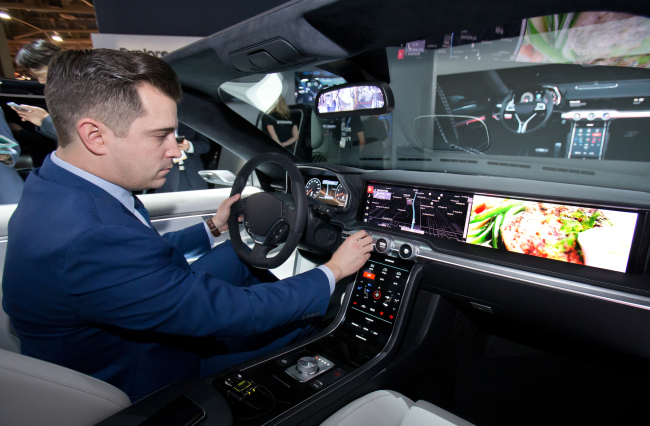 Harman said the user interface of the digital cockpit is based on Samsung’s Galaxy smartphone series, with two Samsung organic light-emitting diode panels and one quantum-dot light-emitting diode panel in front of the driver and passenger seats. Software to control the air-conditioner, music and lighting is operated through Samsung’s artificial intelligence technology Bixby. It also allows drivers to control home devices through Samsung’s integrated IoT service Smart Things. The digital cockpit can be personalized for the driver and passengers via services such as virtual personal assistants, portable profiles and augmented reality, said the companies. Samsung and Harman also announced two new technologies: Drvline and an automotive solution ready for the fifth-generation network. Drvline is an open and modular platform for autonomous driving. Based on the platform, the two companies said they would continue to focus on engineering, high-performance computing, sensor technologies, algorithms, artificial intelligence, and cloud and connectivity solutions. They will first develop a forward-facing camera featuring lane-departure warnings, adaptive cruise control, collision warnings and pedestrian warning algorithms, by combining Samsung’s camera technology with Harman’s advanced driver assistant system. A Samsung Electronics employee demonstrates its advanced automotive platform, digital cockpit, developed jointly with Harman. “Drvline is a platform that can help us to work with our partners for safer, better autonomous driving. Autonomous driving cannot be done by one company so we need to work together and open our platforms to invite our partners and even competitors,” said Young Sohn, president and chief strategy officer of Samsung Electronics. Samsung and Harman also said they would deliver the industry’s first 5G-ready automotive solution and multi-band conformal antenna to enable secure, fast and reliable data communications. In the automotive sector, 5G delivers safety-enhancing capability that is an essential enabler for autonomous transportation. The 5G network boosts speeds up to 100 times faster than current fourth-generation Long Term Evolution standards to provide fast high-resolution streaming, virtual and augmented reality features and seamless cloud-based applications in fast-moving cars, Samsung said. “The future cars will no longer be an isolated island. Just like smartphones are always connected onto networks, a car will also be connected seamlessly onto networks,” Sohn said.